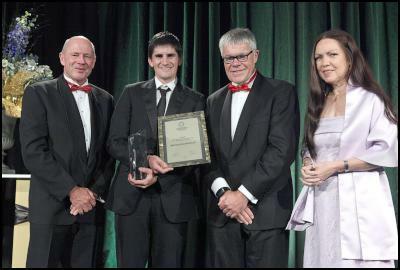 Dr Brendon Bradley was named the New Zealand Young Engineer of the Year at last night’s Engineering Excellence Awards, held at Auckland’s Pullman Hotel. A senior lecturer at the University of Canterbury’s Department of Civil and Natural Resources Engineering, Dr Bradley spearheaded vital research following the Canterbury earthquakes. “He has led a study on prediction models, re-evaluating Christchurch’s seismic hazards, documenting the behaviour of engineered structures and quantifying seismic design loadings for the rebuild,” Chief Panel Judge, Steve Reindler, comments. “It’s an outstanding accolade that’s gone to an outstanding young man. Dr Bradley’s work is providing very real guidance in the way people think about earthquake resistance in a seismically active environment. It’s another example of the way engineers not only shape the world around us but make it safer and more sustainable at the same time,” Mr Reindler adds. Dr Bradley is considered an international research leader in several emerging fields of earthquake engineering and has been a member of the New Zealand reconnaissance teams for overseas natural disasters including the 2009 Samoan tsunami and 2011 Japan earthquake.